Perspective view of a standard biotention basin. 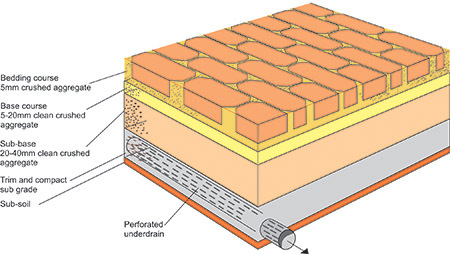 A typical cross-section of permeable paving with an underdrain. How well your new buildings manage stormwater runoff after construction depends on how well you prepare your plans before submitting a development application. The planning stage, well before construction begins, is the right time to include water sensitive design features and to ensure your new development will manage stormwater to the required standard. In the Sydney drinking water catchment, that standard is a neutral or beneficial effect on water quality (NorBE). Water sensitive design on rural residential lots does not need to be unattractive or detract from the landscape when planned and designed properly. For lot-size developments (less than 2,500 square metres) - typically a new house or large shed - you will usually include a large rainwater tank to reuse water, and a raingarden at the lower part of your lot to capture and treat stormwater runoff, including overflow from your rainwater tank. 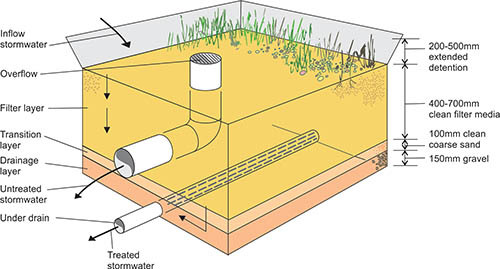 On unsewered lots, you must keep stormwater well away from your onsite wastewater treatment system and the land area where effluent is applied. Landowners are responsible for ensuring that stormwater management measures such as raingardens are compatible with other proposed measures and elements of the development. Raingardens should only be built after all other construction is finished. They are not an erosion and sediment control measure. removing accumulated sediment and garden litter, particularly after storms. How well your new development site handles stormwater after construction depends on the quality of your plans, for the site as a whole and for individual lots (for subdivisions), and on close consultation with your local council during the planning and construction stages. Developers of large sites (over 2,500 square metres) have a wider choice of water sensitive design measures, including wetlands and bioretention basins. Developments can be designed around these features, such as incorporating wetlands as an attractive landscape feature. Individual lot measures still need to feed into the large scale 'common' water sensitive design system. Developers and landowners - you must work closely with your local council in the planning stages to ensure the proposed water sensitive design measures are acceptable and don't interfere with other elements of your proposal. This is especially true if you plan to hand the measures over to council once the development is complete. Large scale developments require sophisticated stormwater quality modelling to determine what, where and how big your various stormwater management measures need to be. This stormwater quality modelling can be undertaken using MUSIC (Model for Urban Stormwater Improvement Conceptualisation) software. MUSIC stormwater quality modelling helps local councils and WaterNSW determine whether proposed large developments will have a neutral or beneficial effect on water quality (NorBE). 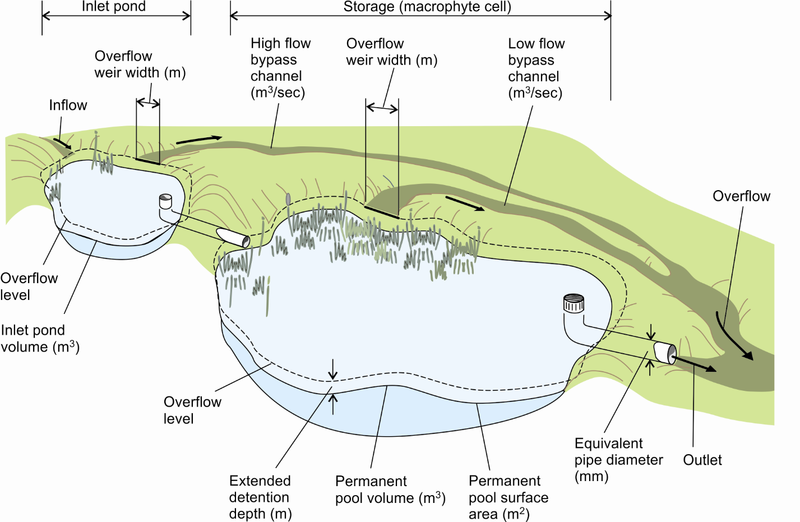 The number of subdivision lots, total impervious or disturbed area, and whether your site is high risk will determine whether your development requires MUSIC stormwater quality modelling in the Sydney drinking water catchment. Developers and landowners should refer to the manual Using MUSIC in the Sydney Drinking Water Catchment at the bottom of this page. A MUSIC stormwater quality model prepared using the manual must accompany those development applications triggering the use of MUSIC, to assess whether the proposal would have a NorBE on water quality. The modelling helps protect the quality of water flowing into creeks, rivers and water supply dams. Include water sensitive design features when planning changes to your property to ensure your new development manages stormwater to have a neutral or beneficial effect on water quality. Use rainwater tanks to harvest stormwater for reuse, saving on your water bills. Use raingardens, grasses and trees to filter stormwater and reduce pollution. Regularly clean gutters, desludge rainwater tanks, and remove accumulated sediment and garden litter, particularly after storms.